Since the commissioning of Remco de Fouw’s highly acclaimed Quintess-ometry in the foyer of University Hospital Waterford in 1991, public art has been central to the work of WHAT. Quintess-ometry comprises an imaginative five-part installation based on themes of balance and harmony. Other commissions include Janet Mullarney’s wood–carved Couple on a Bench and Declan Breen’s High and Dry, which was commissioned in celebration of the new millennium. Both pieces have become visual icons for University Hospital Waterford. The Healing Garden was made with the aim of creating a quiet retreat in the hospital grounds. Designed by Saturio Alonso and Aifric Gray, it is based on research into places of ritual, especially holy wells in the South East of Ireland. 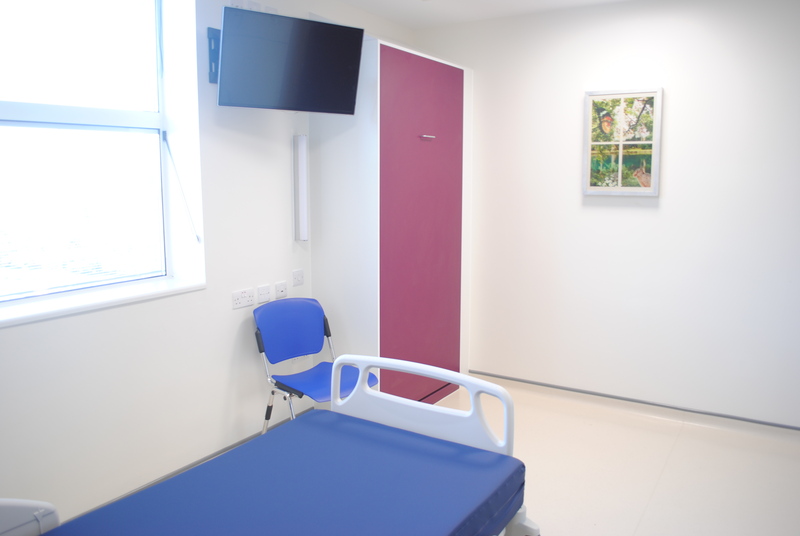 In a move to make art more accessible to patients, back-lit artworks by Michael Durand, Aidan Dunne, Brigid Teehan and Annabel Konig can now be seen in a range of clinical spaces in the hospital. WHAT also worked in partnership with the physiotherapy department and the paediatric ward on commissioning John O’Connor and Raúl Vicente respectively to produce innovative, integrated artworks for those areas.